Hyundai is prepping a second tuning study that will debut in early November at the SEMA Show in Las Vegas. 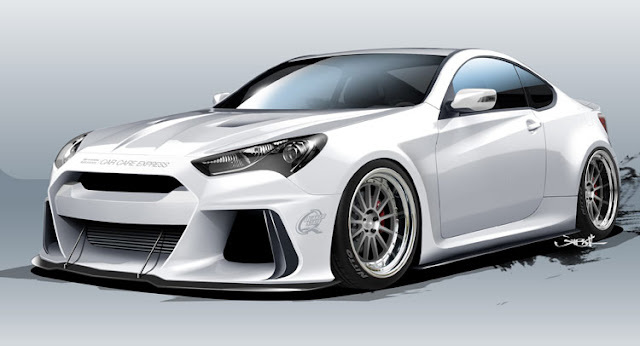 Based on the Genesis Coupe, the show car was built by ARK Performance, which fitted it with a race-inspired “Solus” body kit, an ARK Legato trunk spoiler and APR Performance carbon fiber front splitter. The vehicle combines the wide body kit with a redesigned interior which features a redesigned dashboard, racing steering wheel and gauges and carbon fiber components. Under the hood sits a “Lambda” V6 engine stroked from 3.8 to 4.0 liters for more power. Thanks to the addition of a Rotrex supercharger and strengthened engine internals, the Genesis Coupe study develops more than 500 horsepower. A 6-speed manual transmission sends the power to the rear wheels, which are shod with sticky, Nitto rubber. ARK Performance says these modifications transform the car into a premium coupe with Hyundai adding that “it can go toe-to-toe with top rivals from around the world,” taking on the likes of "the BMW M4 and Lexus RC F". “The Genesis Coupe is the perfect platform for developing our performance product lineup. Hyundai’s 3.8-liter engine is strong enough to handle all the extra power we’re now developing, and the chassis is well balanced and easy to modify, allowing us to create this lowered, aggressive stance while maintaining that clean look we’re going for,” said Kevin Bentley, Marketing and Sales Manager, ARK Performance, Inc. Source & Complete list of Modifications.